Lately, I’ve been sharing quite a few explosion drills, and today I’ve got an awesome linebacker drill that moves the explosion to a different dimension – the lateral explosion. This linebacker drill develops good foot work, as well as hip alignment to the oncoming offense. This linebacker drill can be used for 3 or more players, and uses pad/bags. 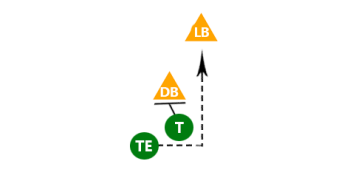 The defensive linebacker will face the other line, but should be approximately 5 feet away diagonally, from the first player holding a bag. Starting in a good linebacker position with the knees bent, the defensive player will take off towards the first bag and drive low into the offensive linebacker. Explode up into the bag with your hands, and then immediately backpedal and explode into the next player/bag. At the same time, the player with the bag is going to step towards the defense, simulating an offensive lineman. If you give yourself a little bit of recoil, you will have a better chance of keeping away from the line of scrimmage and giving yourself the chance to make a better tackle. It’s important this linebacker drill isn’t done as a “hurry”, where you are just slapping bags. You really want to emphasize good body position, staying down low, and making sure that as you slide across, you pay attention to the hands and feet. For more linebacker drills, be sure to Become a Fan on Facebook! You can also Follow Me on Twitter and Hangout with Us on Google+!